It's already December! Can you believe it? I think I can officially say it is downright cold here in St. Louis. I've been making good use of the fireplace and enjoying flannel pajamas, warm "golden mylk" (recipe coming soon) and these vegan pumpkin muffins. That's right, I'm not letting you disregard pumpkin quite yet. I recently shared this recipe over on Nutriciously, but I thought I would post it here for my readers to enjoy as well. I promise you, this new pumpkin muffin recipe is one you will want to make over and over again. These pumpkin muffins are made with a cozy blend of warming spices and wholesome ingredients that will nourish your body. These muffins are sweetened ever so slightly, which will keep you satisfied without sending your body into a surge of sugar havoc. The sweetness comes from apple puree and a little coconut sugar to add a depth of caramelized flavor. I absolutely love serving these warm, slathered with almond butter and an extra sprinkle of cinnamon. I also recommend serving with a dollop of my sweet cashew cream or alongside some yogurt (dairy-free optional) topped with cinnamon and hemp seeds for a more filling option. Go make these muffins, cozy up on the couch with some tea and relax and enjoy the present moment. 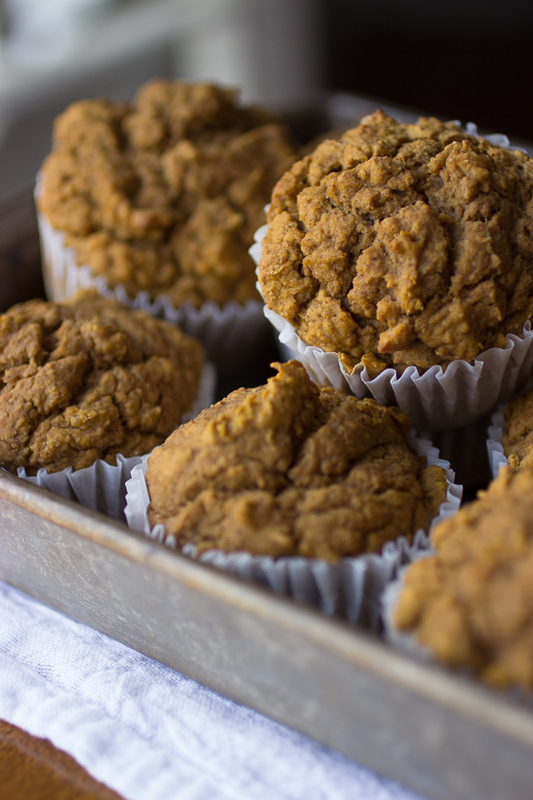 Naturally sweetened pumpkin muffins filled with warming spices. Preheat the oven to 400F. In a medium bowl, combine all dry ingredients. In a separate bowl, add the wet ingredients and mix together well. Add the wet ingredients to the dry and mix until just combined. Careful not to over mix! Place about 1/4 cup of the mixture into a lightly oiled muffin tin. Place the muffin tin in the oven for 20-23 minutes. The muffins are done when a toothpick comes out clean. Notes: May substitute your favorite gluten-free blend in place of the spelt flour.